Can you believe that Spring is here? Here in Oklahoma, the weather is still making up its’ mind whether it really wants to be Spring. But soon, we’ll be complaining about the heat! Meanwhile, April is a month full of holidays and activities that will spread kindness and joy like confetti. There are several holidays that we can celebrate by showing how we take care of ourselves, other people and the environment. There are a variety of holidays that I am certain will generate goodwill and positive thinking around the world. There will be no time for bullying in April! 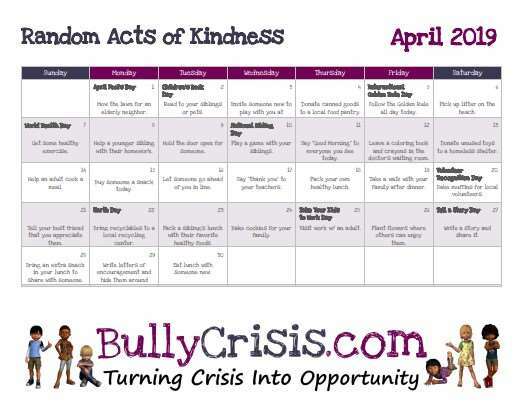 Our Random Acts of Kindness calendar for April has lots of fun and easy activities that are guaranteed to brighten someone’s day. On each holiday, we tried our best to match the activity of the day to the theme of the holiday. We want to see your acts of kindness in action…so send us your photos and we’ll share them on social media. If you have any ideas you would like to see added to our monthly calendars, be sure to let us know! Here is the April calendar…be sure to print yourself a copy and mark off the activities as you complete them. Remember, too, that you can mix up the activities and do them on any day that works for you and your family.